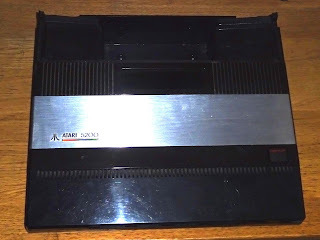 Here we have an Atari 5200 games console. 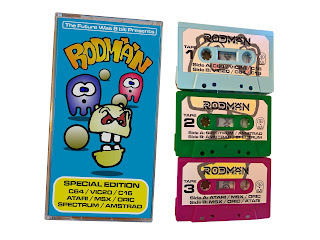 Bit of an odd one this, one of their least successful creations. 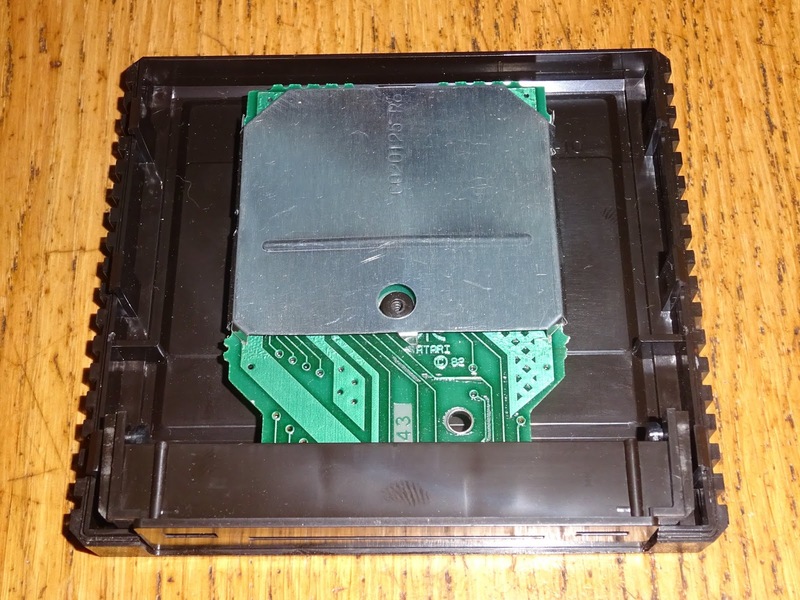 It's a massive thing, made even larger by a storage compartment at the back for the custom controllers (more on those later). 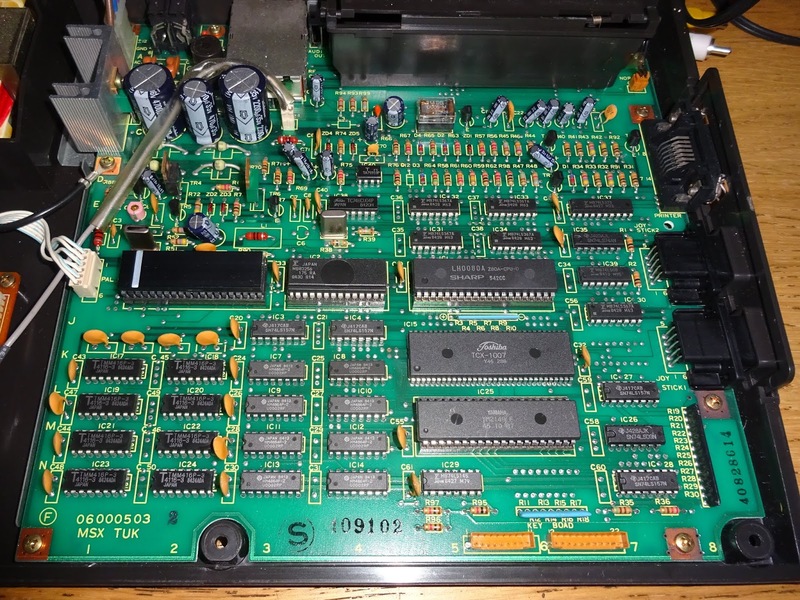 The board is only 2/3 of the size of the case, but it is still massive. 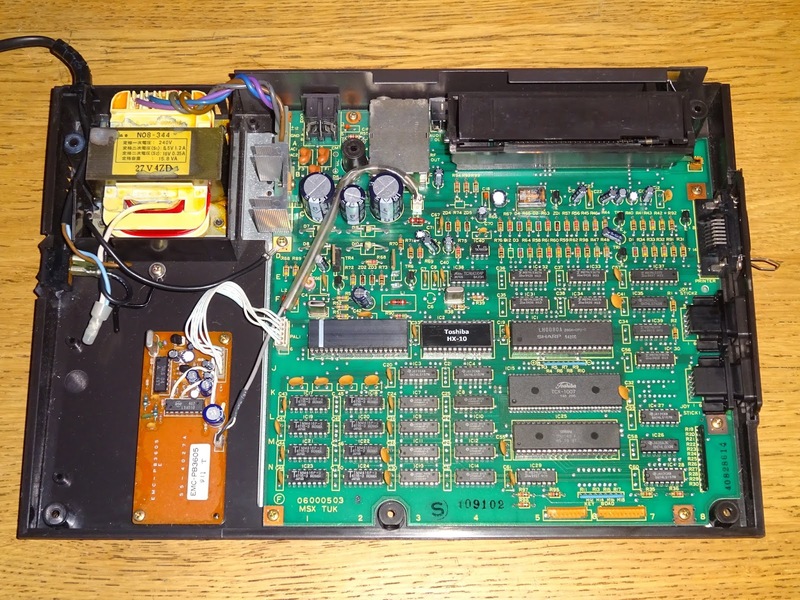 There are lots of things on the 5200 that seem like nice ideas that should have been optimised out before production started. There is only a single wire coming out of the unit. This is combined power in and TV out, and connected to an external box that was meant to sit behind the TV. 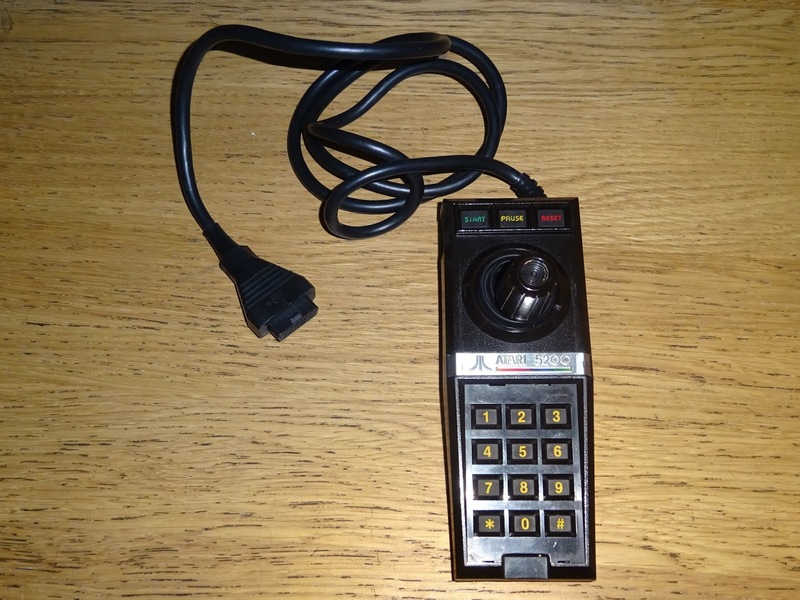 This being the 5200, it wasn't just a power injector, it was an intelligent box that detected when the 5200 was drawing power and switched the aerial input on the TV over to the 5200. 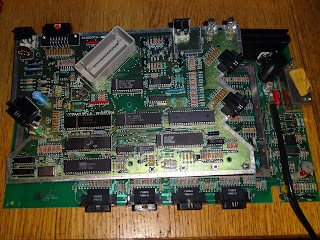 Inside, the power is split off, but doesn't just go to power the unit, there is a whole load of circuitry to do a soft power on / off switch, and also an interlock to stop the unit powering on if there is no cartridge installed. 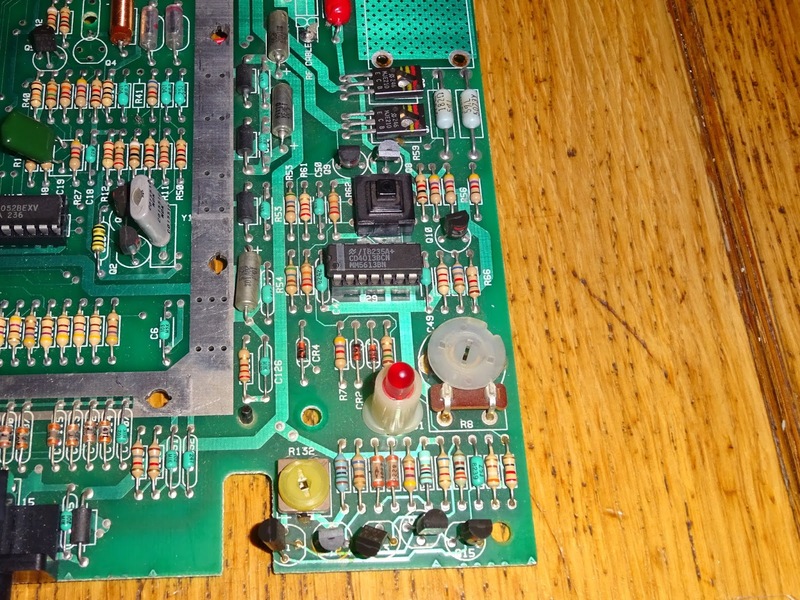 When the power is actually switched on it feeds not one, but two 7805 regulators on a strange double heatsink. 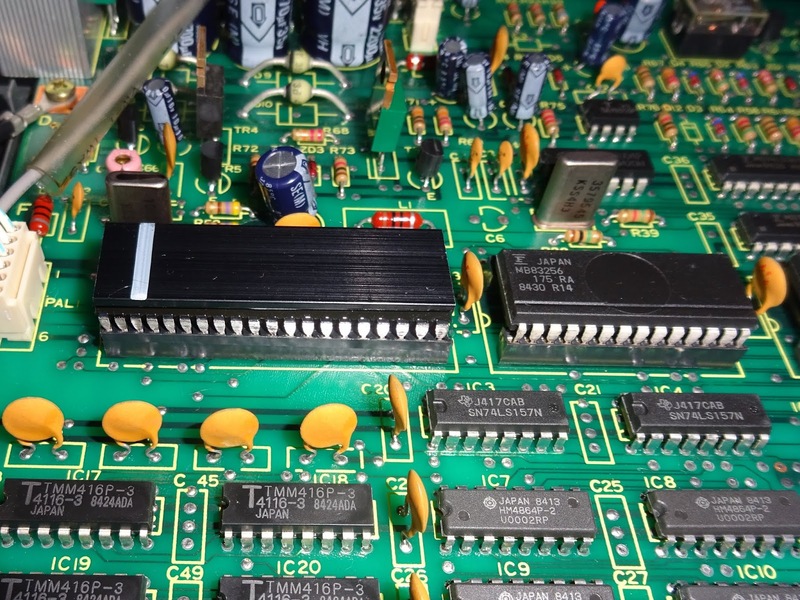 One power the digital circuitry, one the analogue. 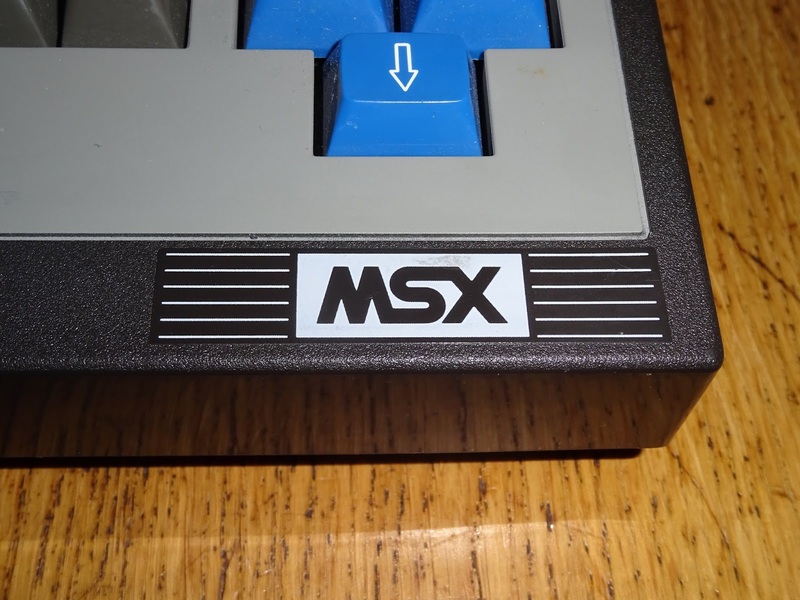 The controllers are also a bit special. They have a keypad, start, pause and reset, four fire buttons (two duplicated on each side), and an analogue control stick (which doesn't self centre). 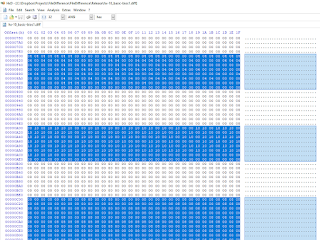 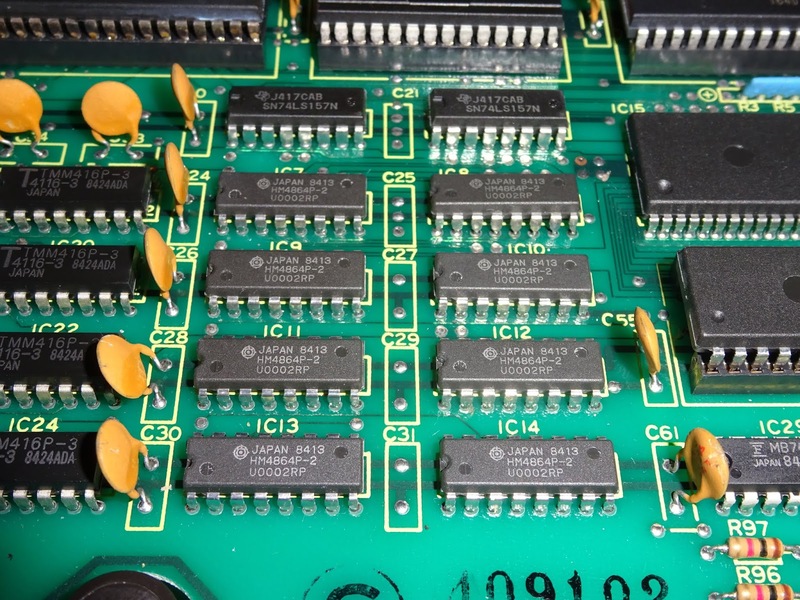 This extra complexity means there is are a lot of components for each port, plus a row of 4052 multiplexers. I've yet to find a working one, the two that came with this system suffer from flaky pots, and flaky membranes. 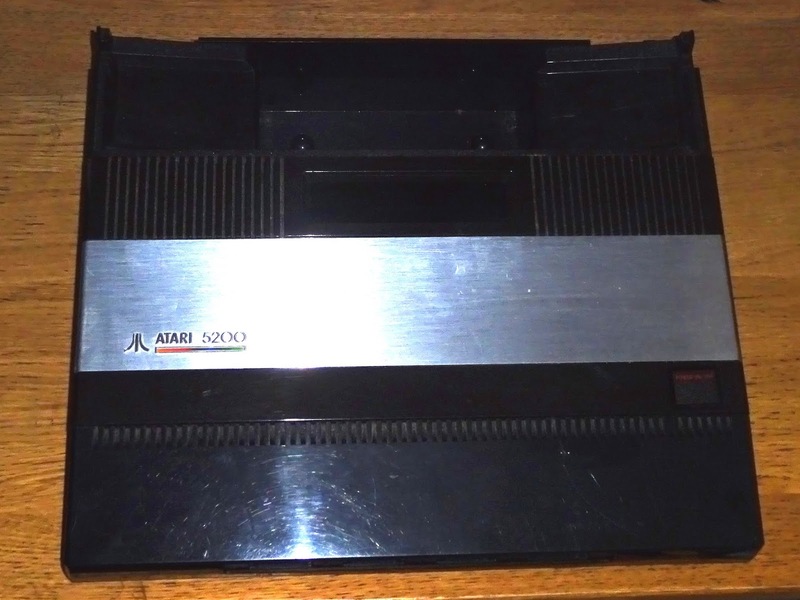 To match the system, the cartridges are also super sized. 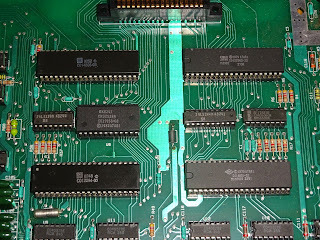 It's so big, they have had to add extra shielding around the PCB. 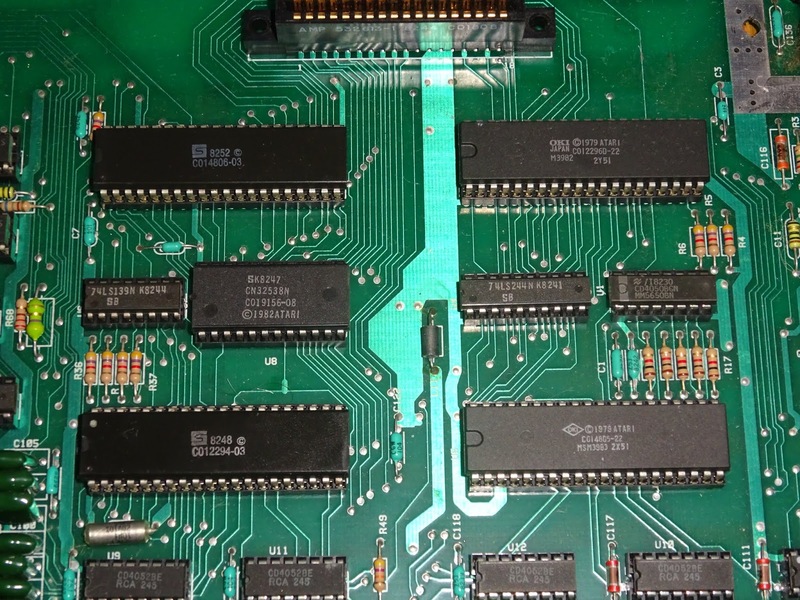 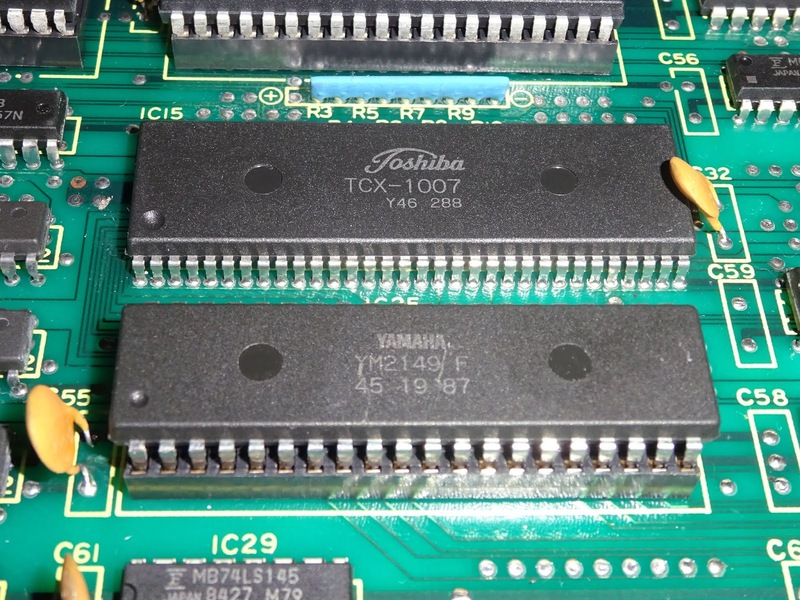 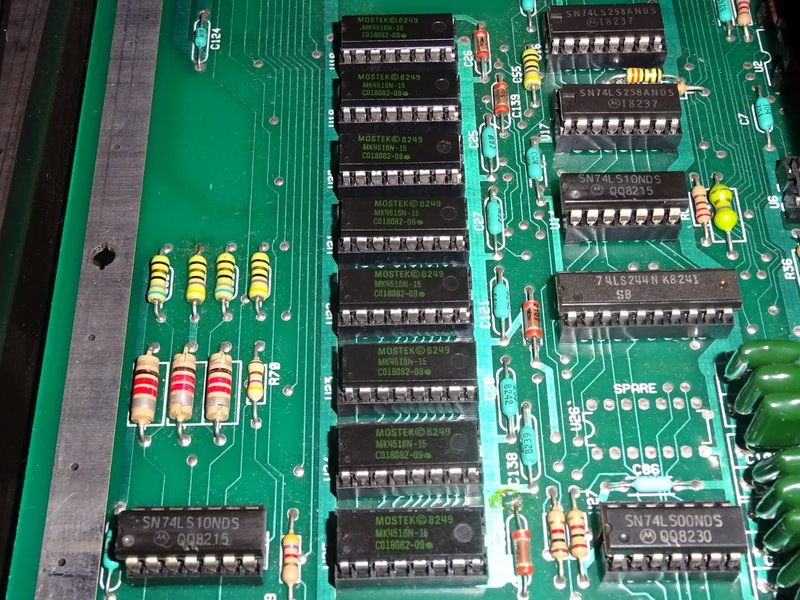 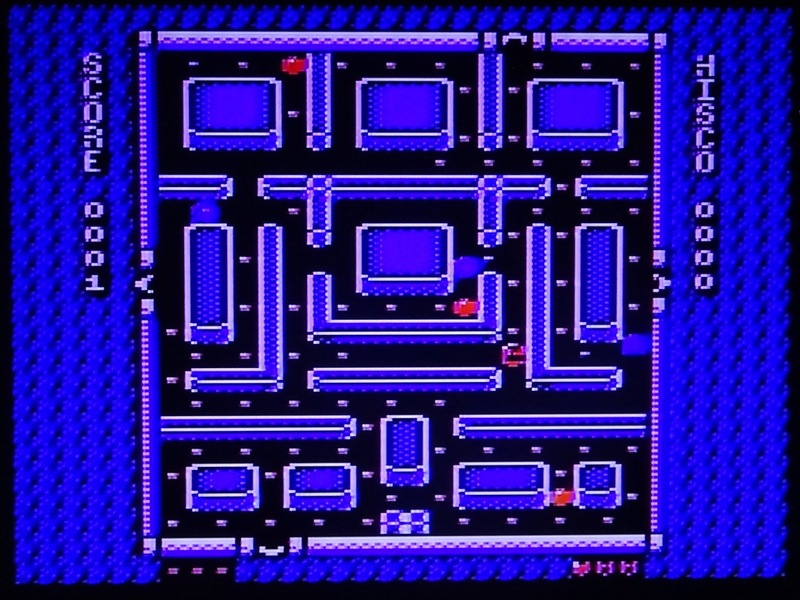 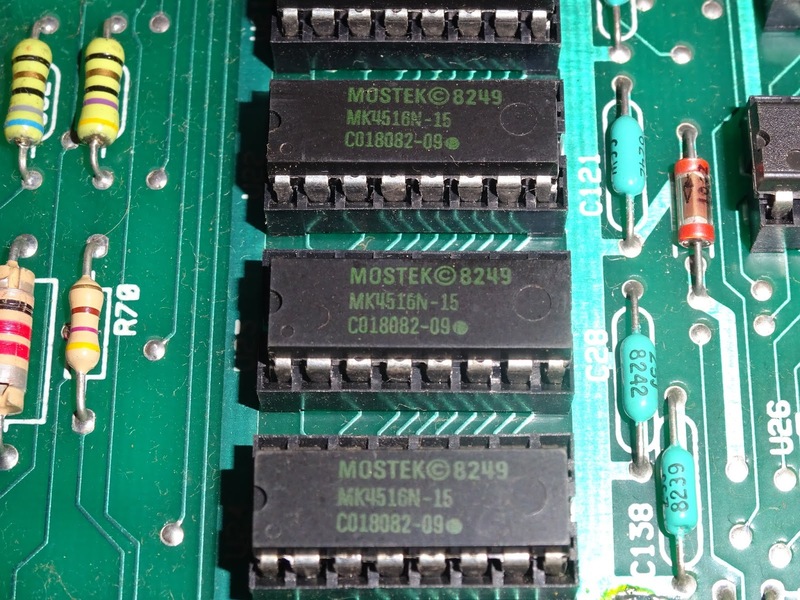 However inside, the boards only need to contain 1 or 2 ROM chips (there are two 16K banks available). 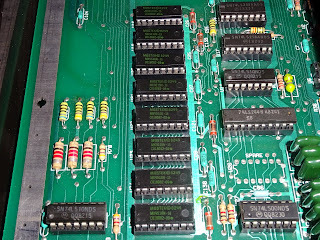 The XEGS board is a whole lot smaller, but actually contains much the same chips. To be honest, the XEGS is the console the 5200 should have been. The 5200 has the same CPU, ANTIC, POKEY and GTIA chips from the 400/800/600XL/800XL, just missing the 6520 PIA, but has been designed to not be compatible with them. 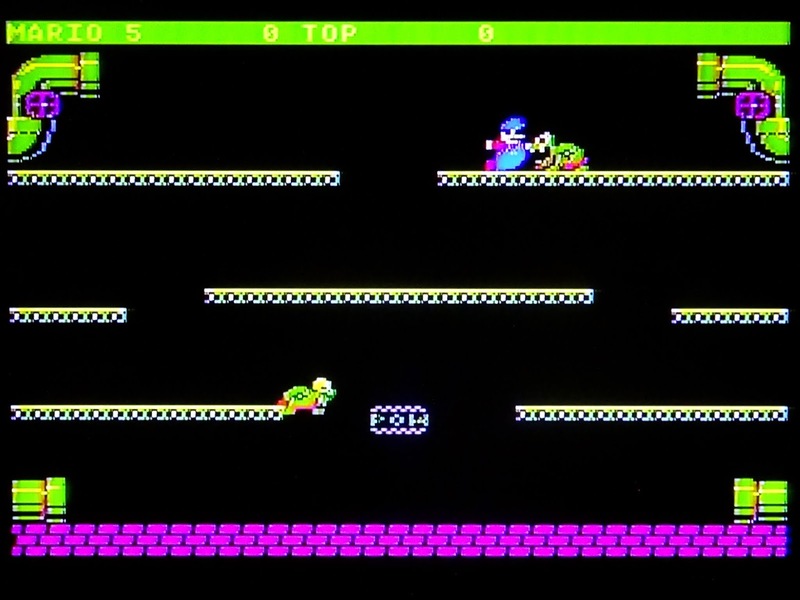 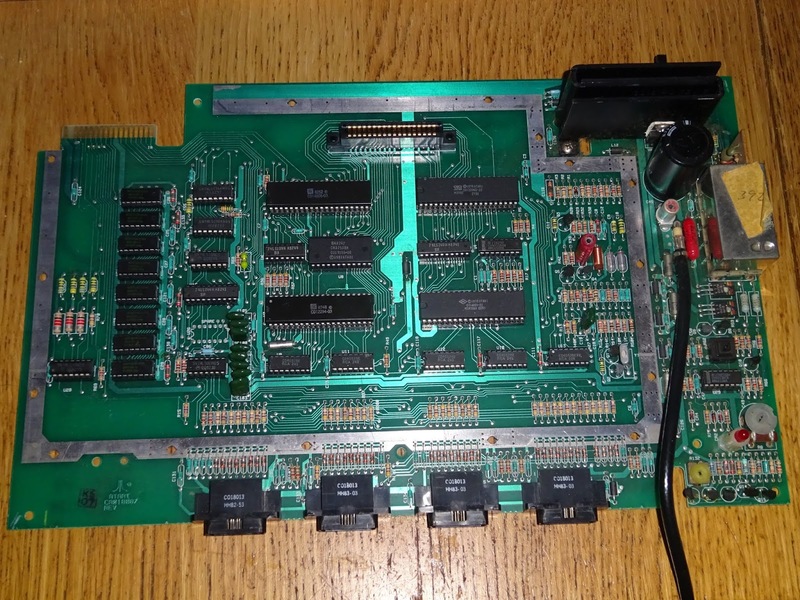 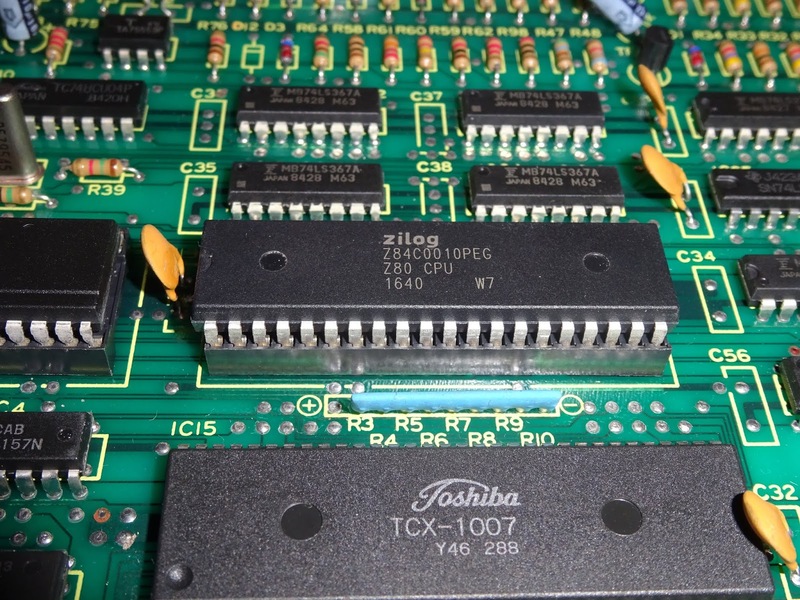 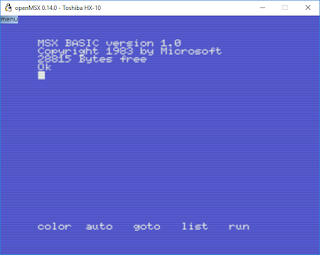 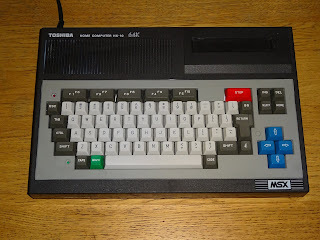 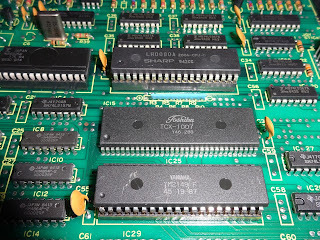 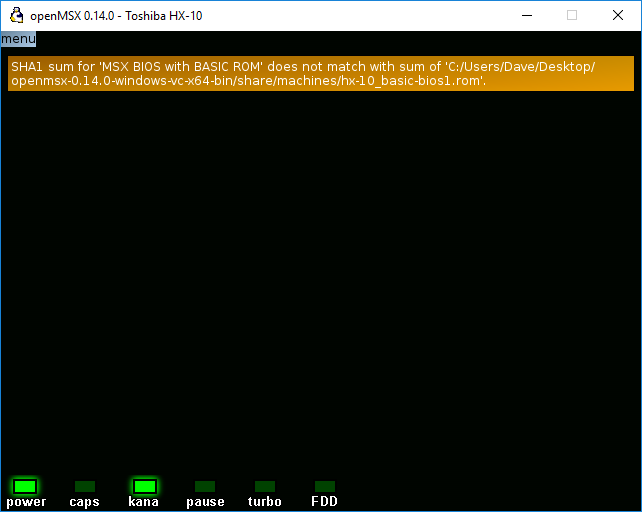 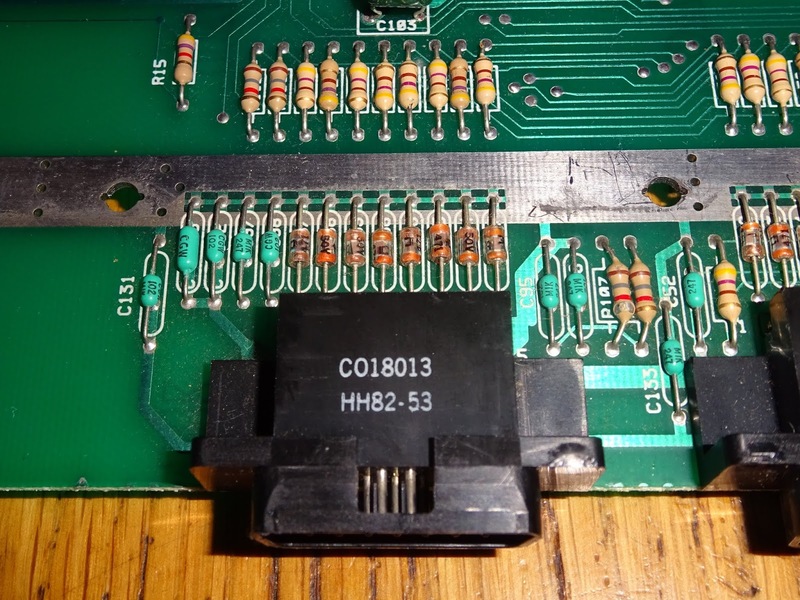 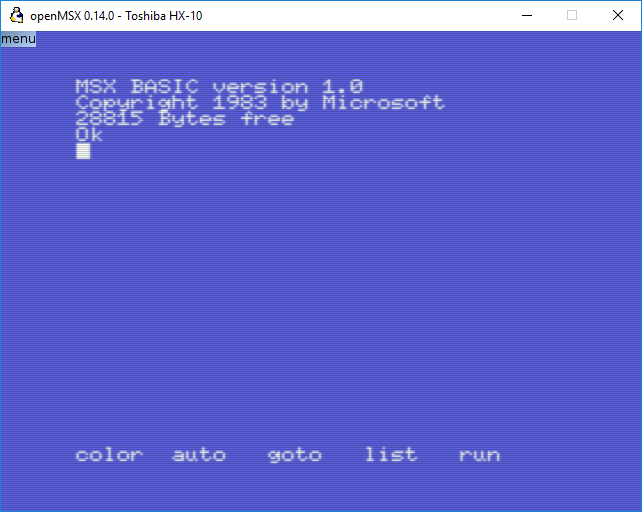 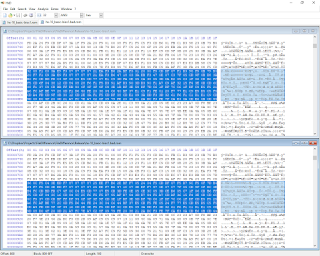 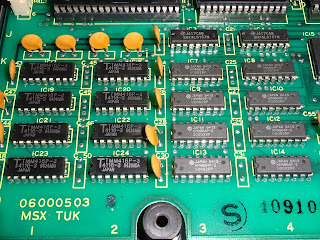 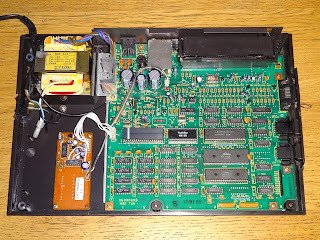 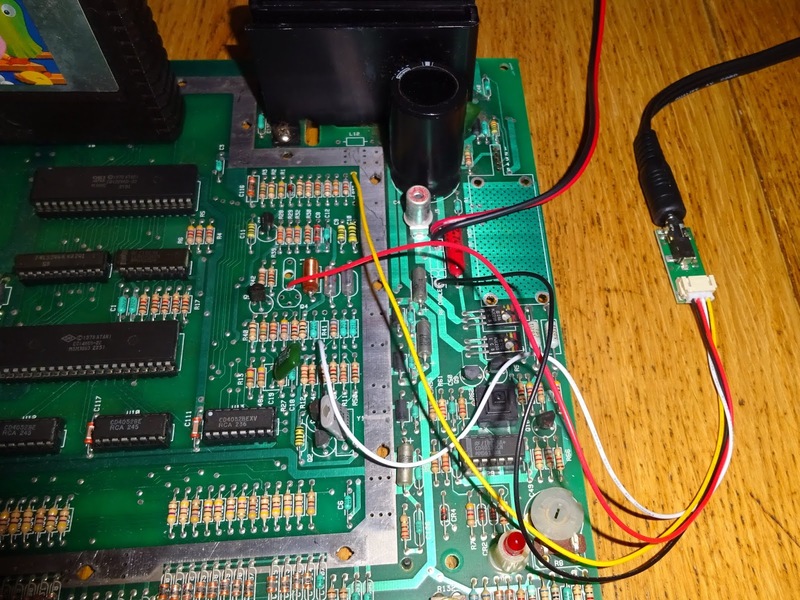 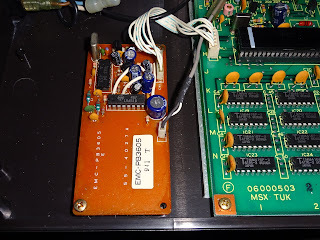 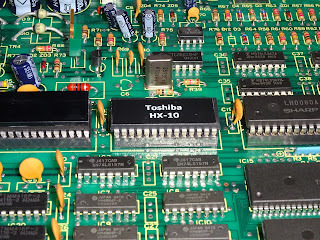 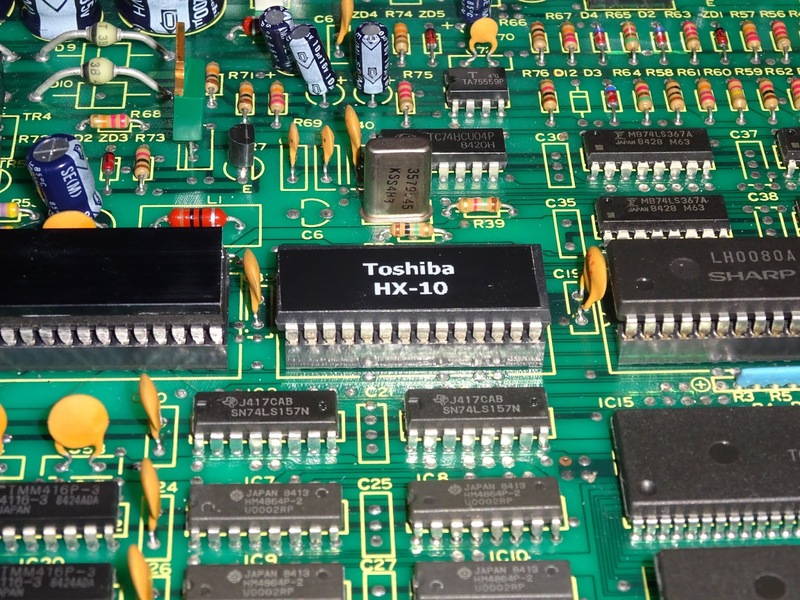 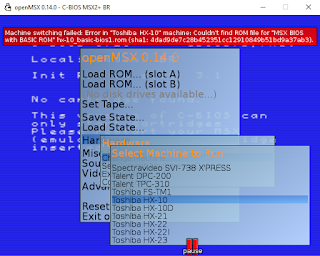 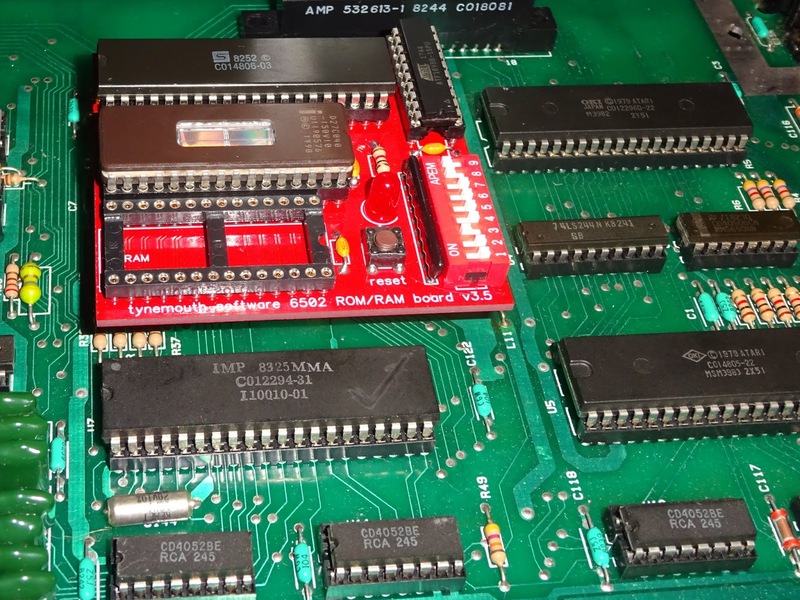 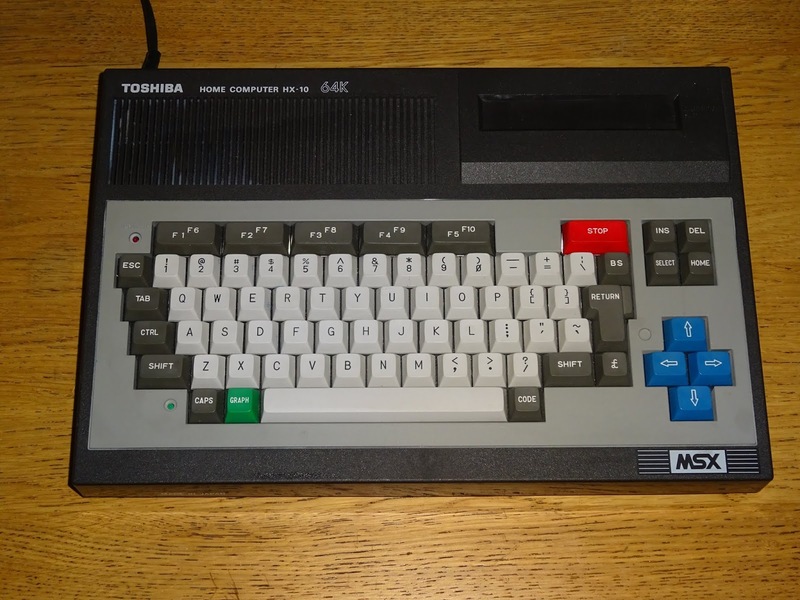 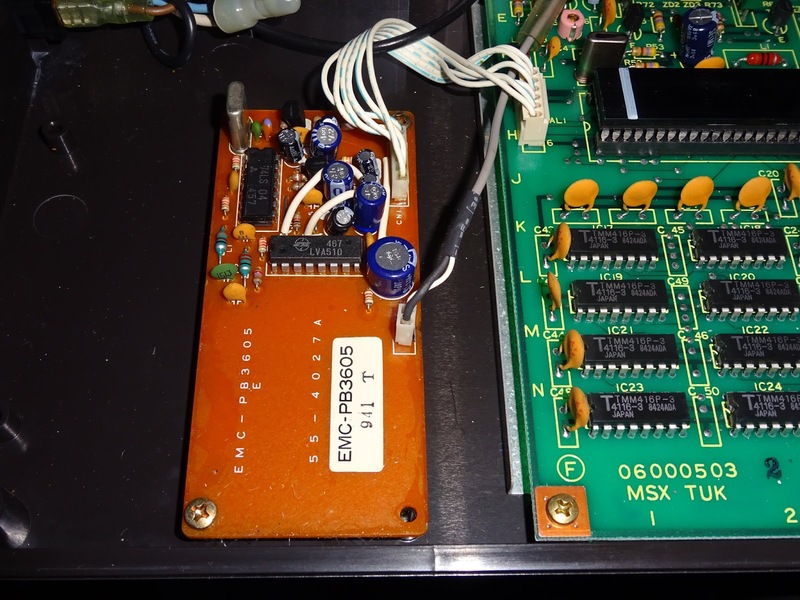 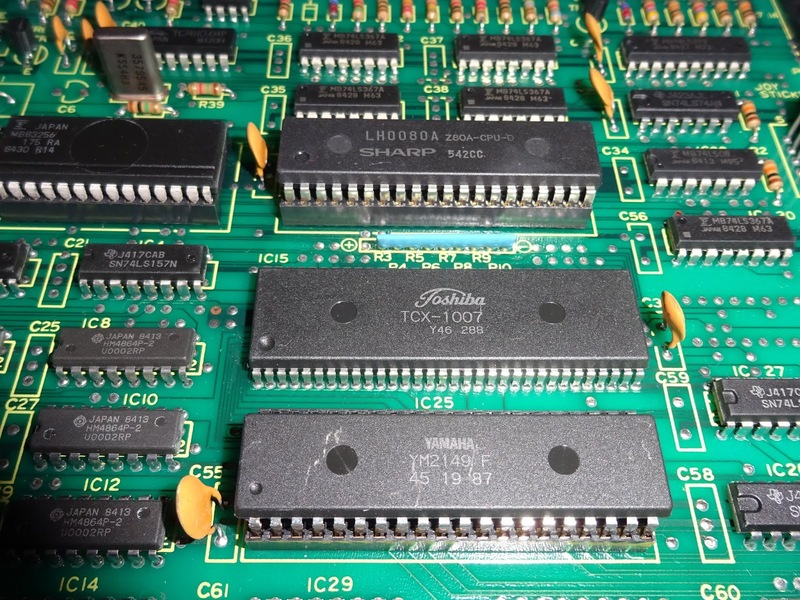 The XEGS has the additional MMU and Freddie chips from the 65XE and 130XE, but like those is still compatible with the majority of software and cartridges from the 400 onwards. 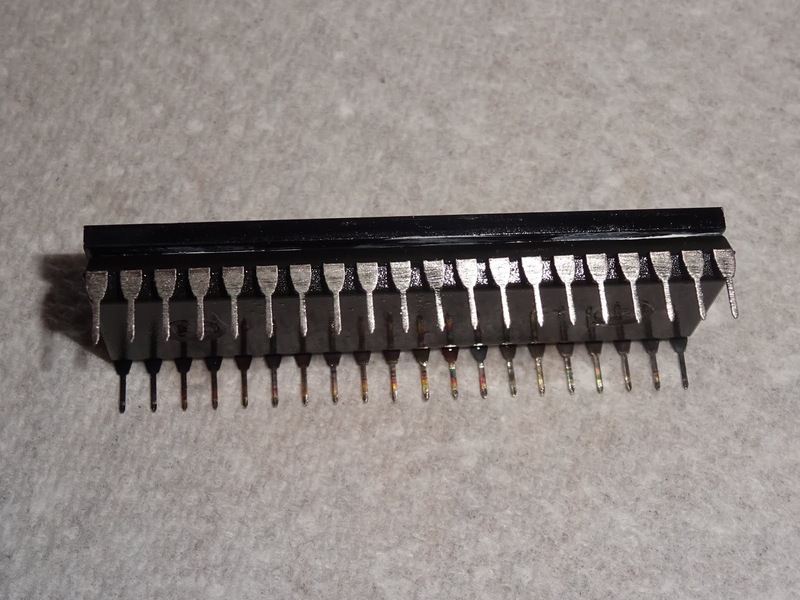 It only has 16K, but one interesting thing is this is made up of 4516 chips. 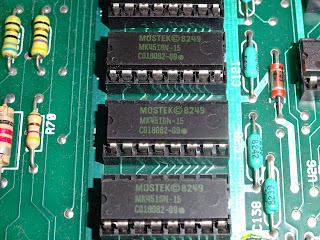 I hadn't come across these before. 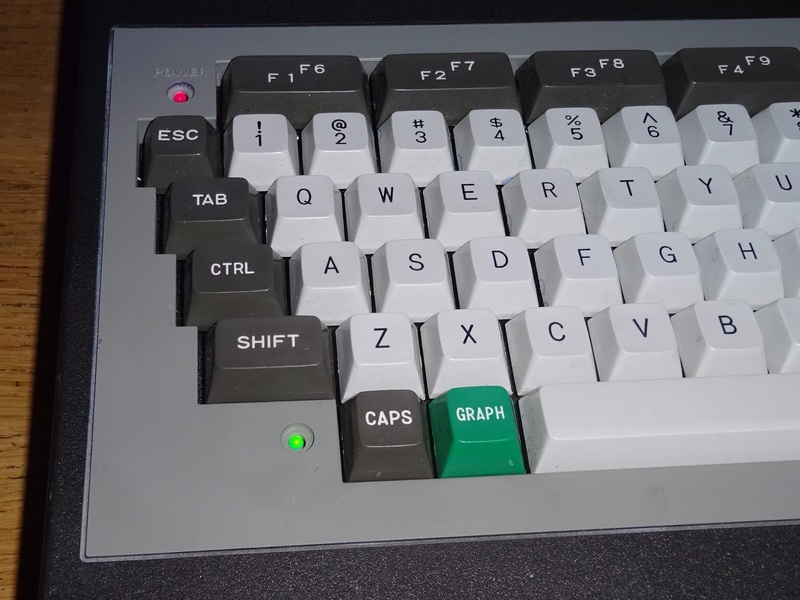 I wonder why they weren't more widely used. 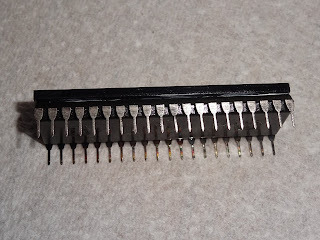 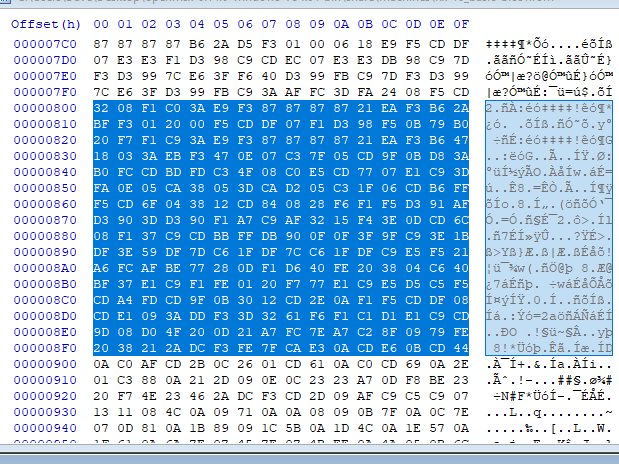 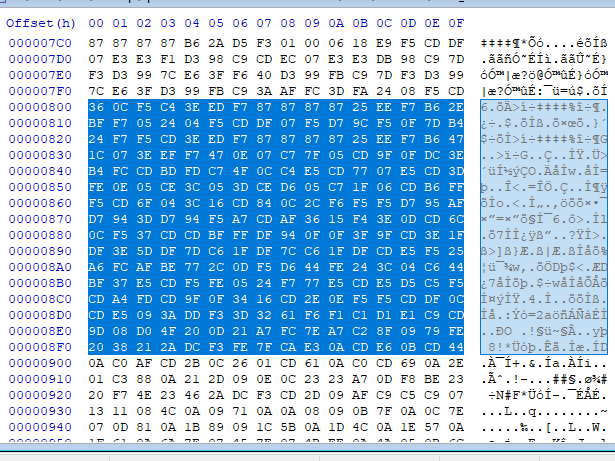 The are basically 16Kx1 DRAM chips, like a 4116 but with a single 5V supply. 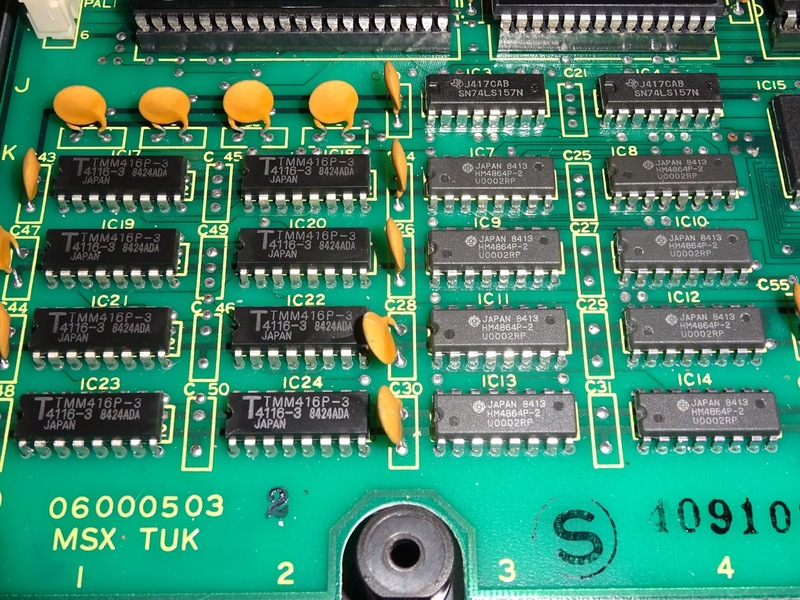 Imagine how much simpler (and more reliable) the design of things like the ZX Spectrum would have been if they didn't have to generate 12V and -5V for a bank of 4116 chips. This is the circuitry around the power input, I want to convert this so I can just supply it 9V DC from a normal mains adapter. 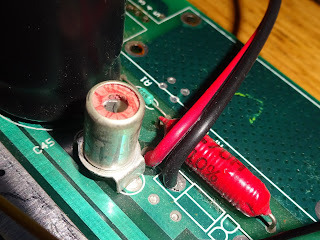 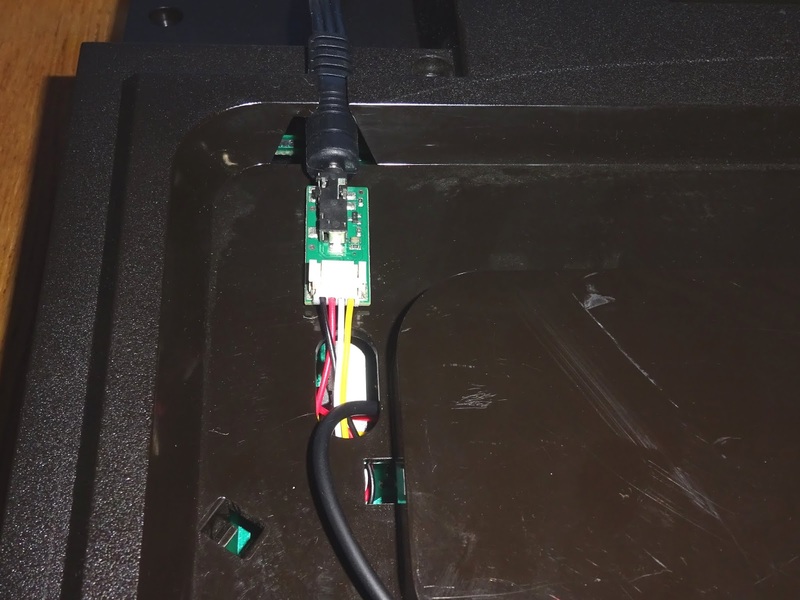 It turns out to be quite simple, once the modulator and input cable are removed, 9V DC could just be fed into the same point the main cable was removed from. 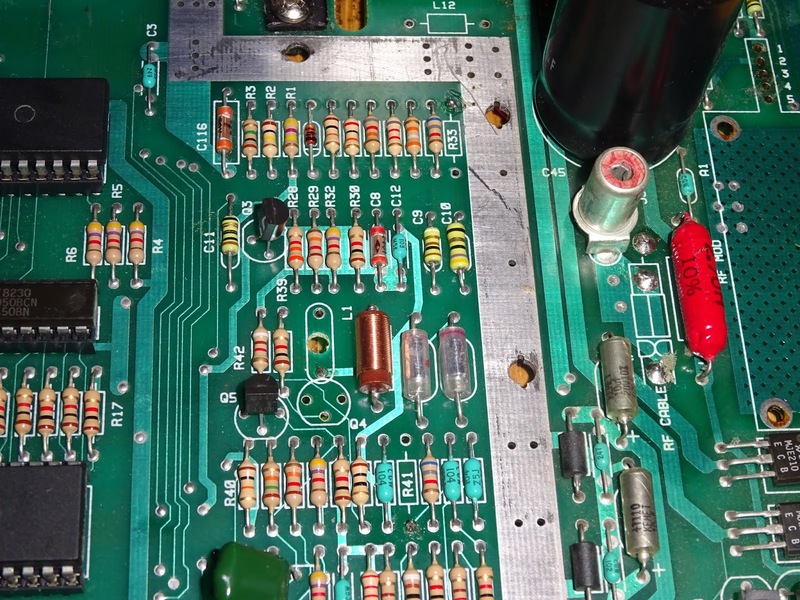 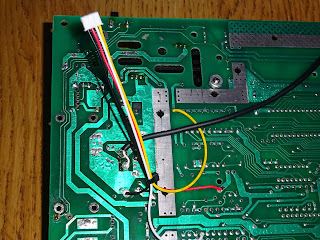 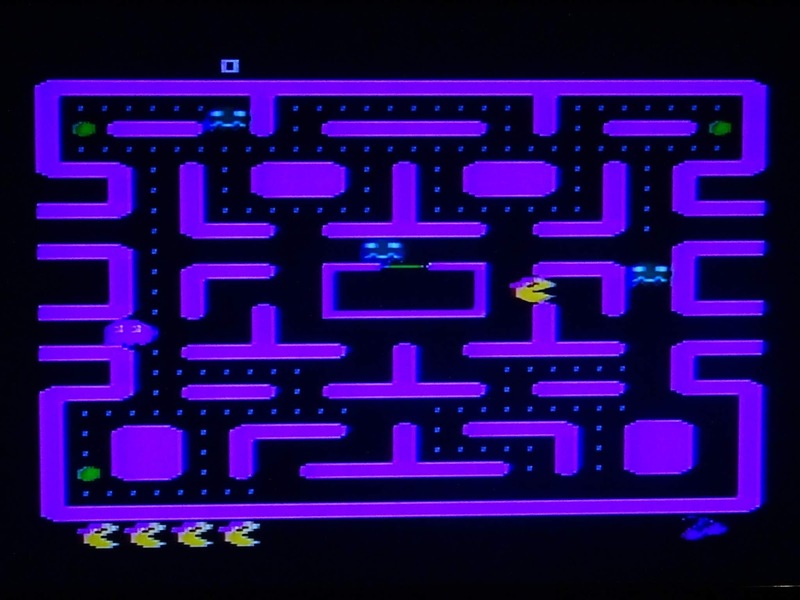 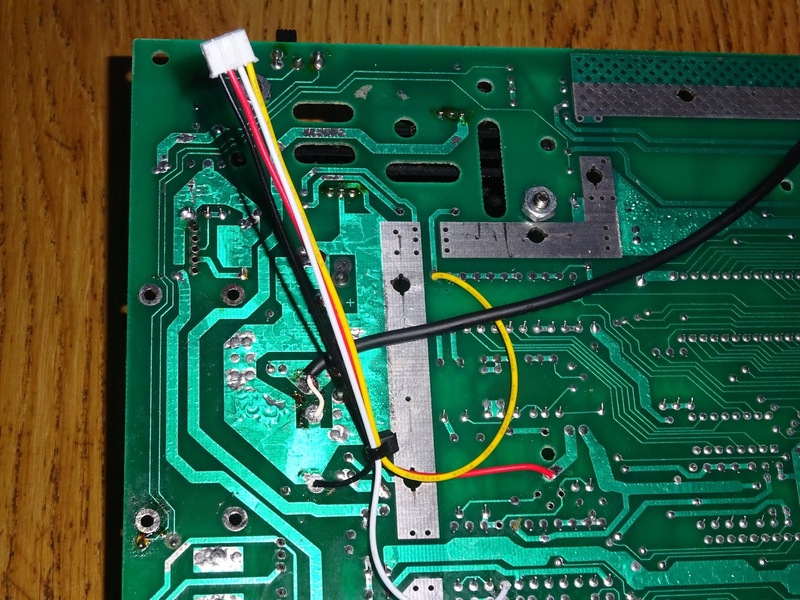 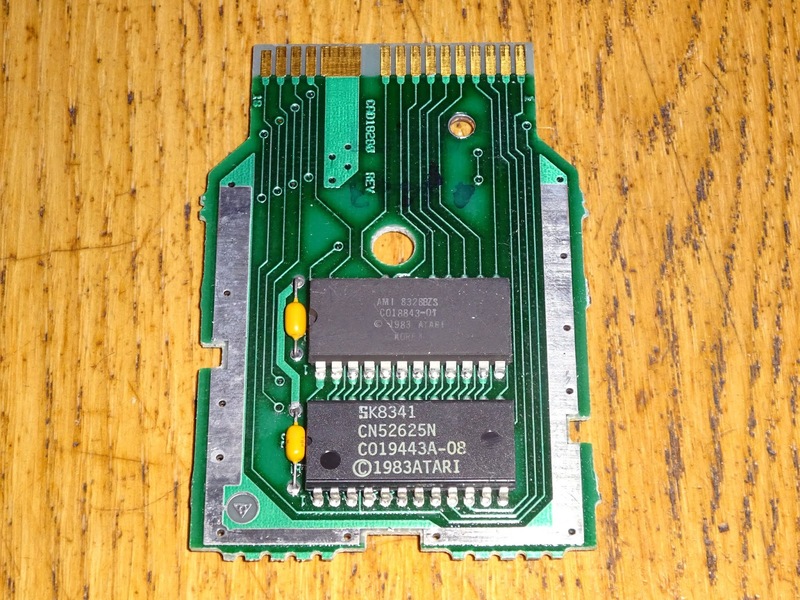 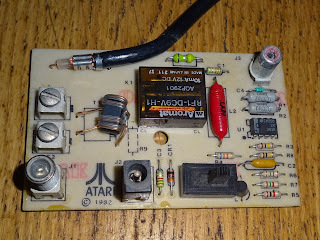 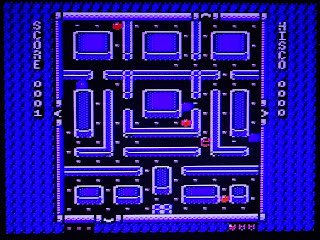 The composite video conversion was much the same as other Atari computers, an almost identical circuit is used, so just locate and remove the same parts as usual. The resistor R32 connects the audio circuitry to the video output, so that can be removed. 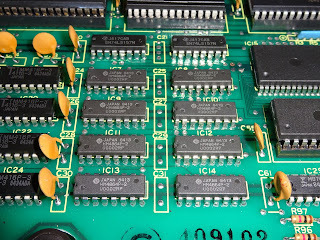 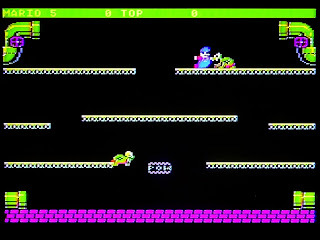 L12 connects the video out to the modulator circuitry, likewise. 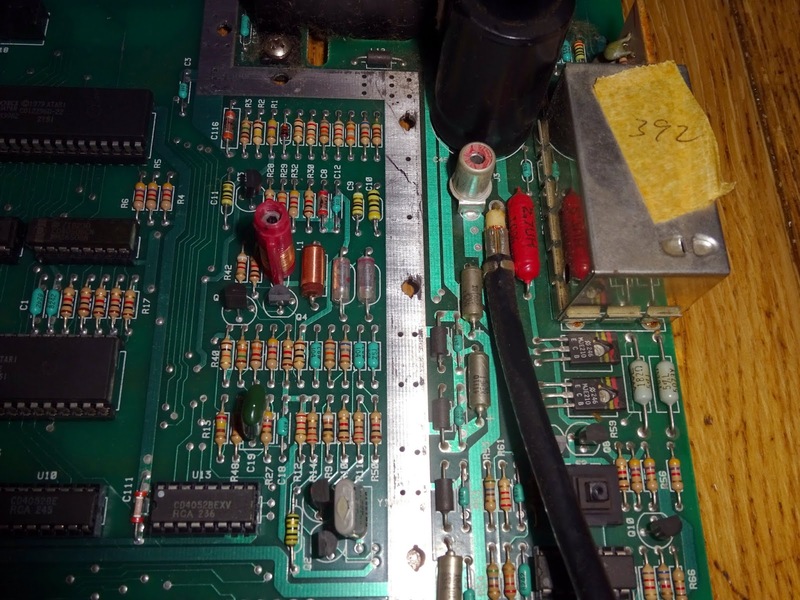 Q4 and L1 disable the AF oscillator, and R41 disconnects the decoubled audio from the rest of the circuitry. 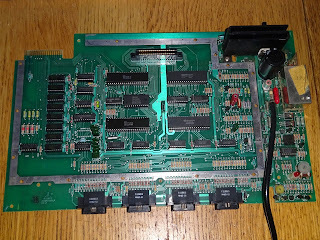 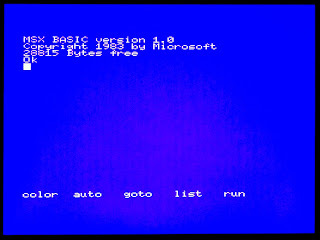 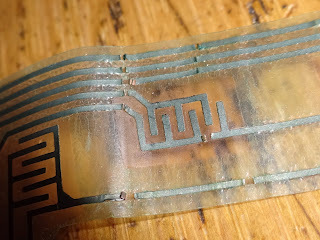 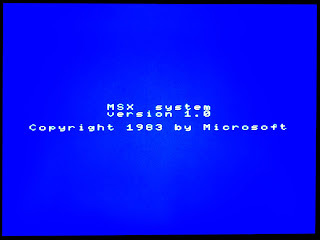 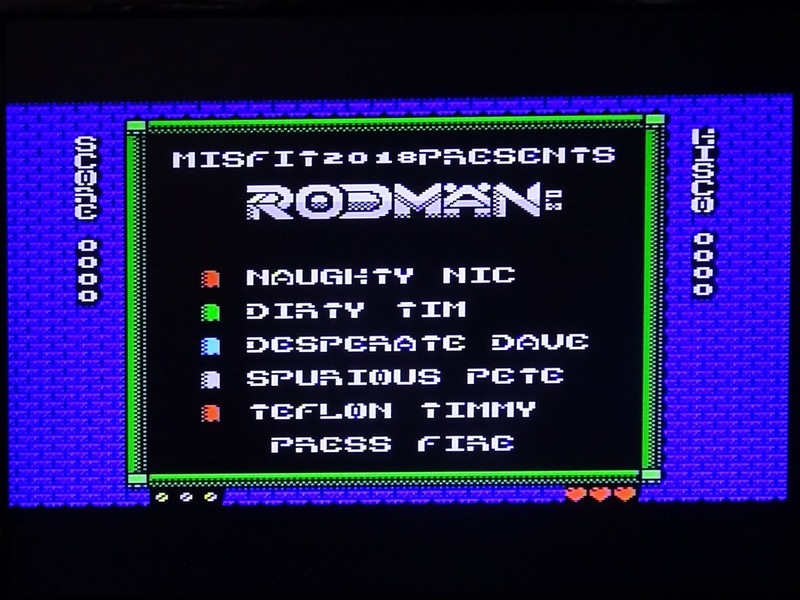 To test this, I temporarily connected the composite video buffer board to the usual points. 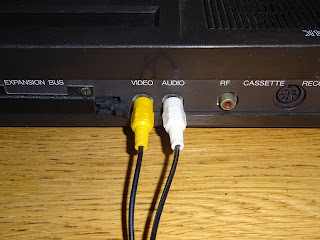 Not this is for testing only, you should never leave the leads this long when installing it, as they are can pick up noise is left too long. Given the split supplies of the 5200, I took the 5V from the top of L1, which was on the analogue rail. Ground came from the second pad where the original RF lead attached. 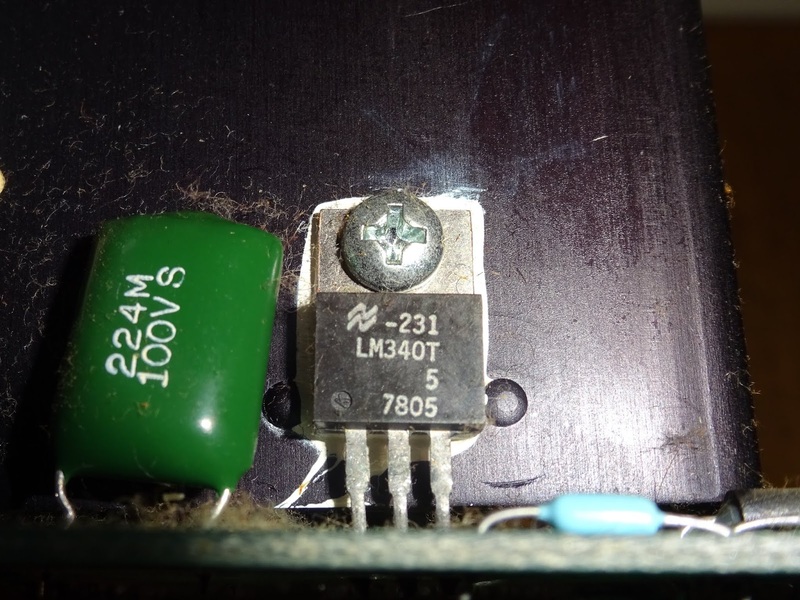 Audio was taken the bottom of R41, and video from the top of R32. 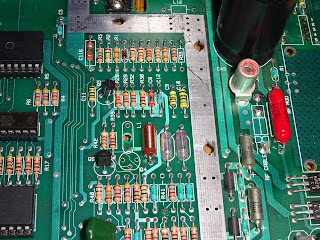 That worked very nicely, power rails all measuring 5V, and a good picture. 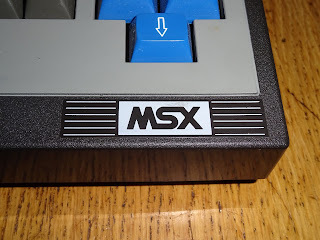 It took me a while to get past the title screen, as the start button wasn't working on either controller, so I had to find the appropriate pins to connect together to 'press' the start button. 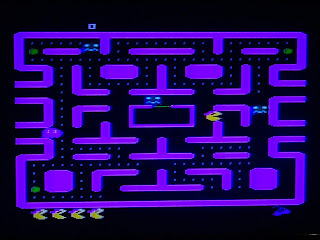 But then we were away, although it only moved left - I still need to fix the controllers. 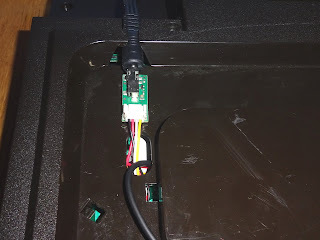 I spent a while looking at options for mounting the connectors. 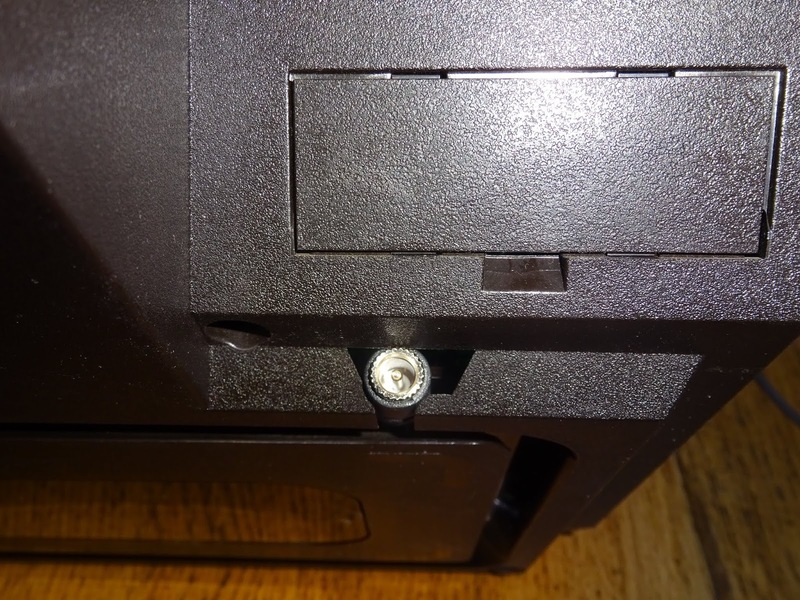 There were no suitable holes to mount things to, and I don't like drilling cases if I can avoid it. 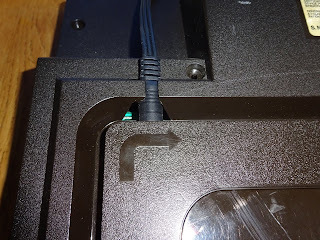 I found there was a section of the bottom panel that was originally used to coil the cable around, and that could be removed. 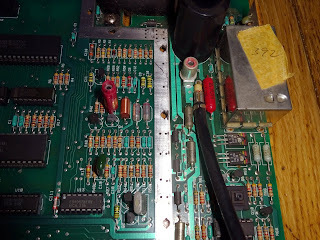 Under that, I could fit the AV buffer board, and have the jack plug poking out one of the existing cutouts in the case. 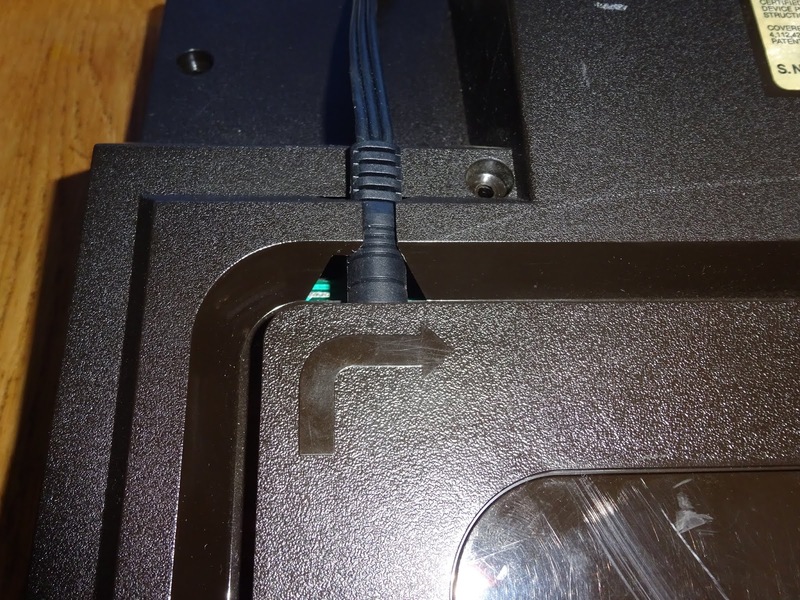 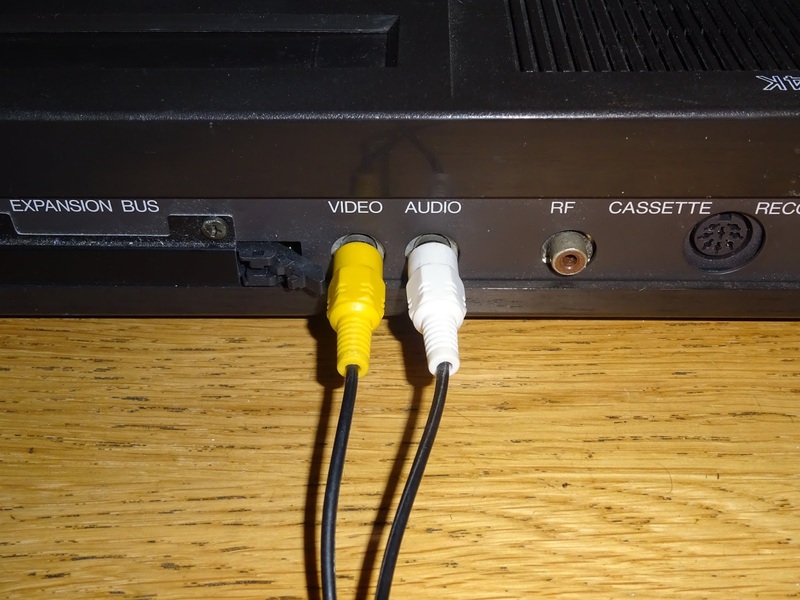 The cutout on the other side was used to house the end of a 2.1mm DC jack extension lead, which wedged in place, to allow the power supply to be unplugged when not in use. 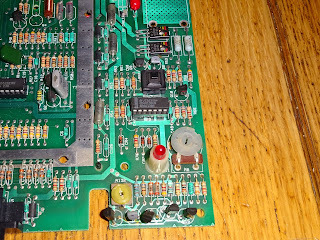 With he trim back in place, the board was hidden and you are just left with the cable exiting neatly from the base. 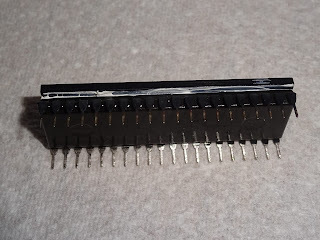 I shortened the leads and reattached them from the back of the board to tidy things up, pushed the connectors through the hole in the case, and that was all ready to go. 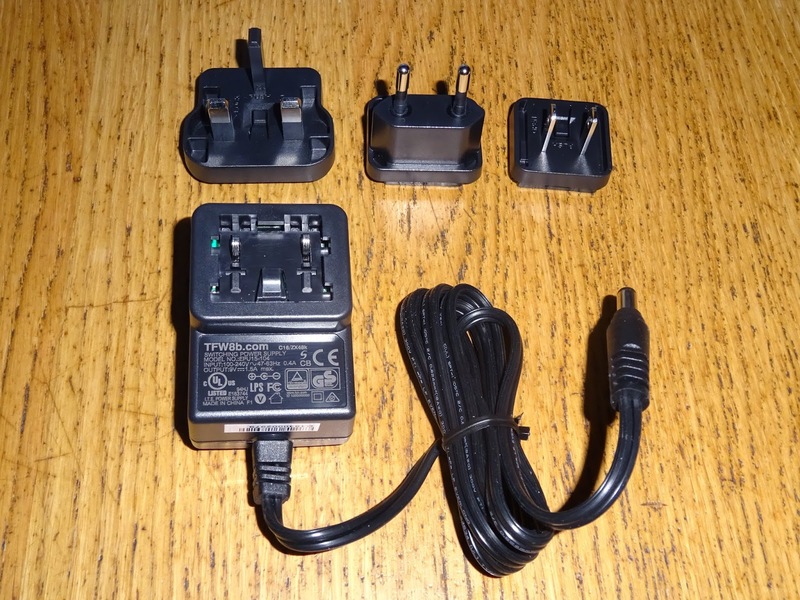 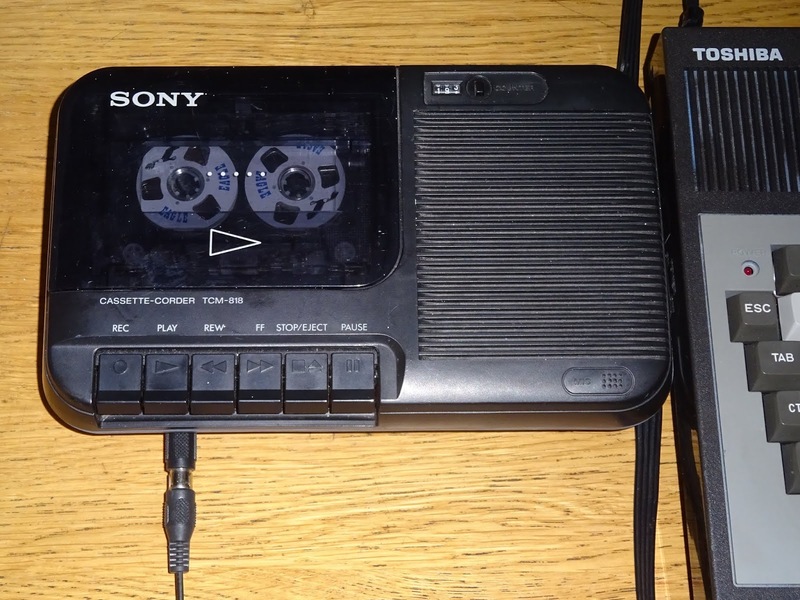 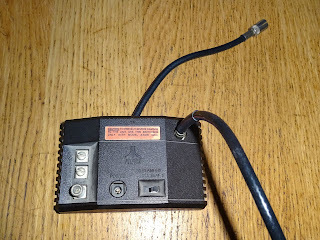 The power connector was wired 9V, centre negative, to match the other devices I use regularly, and so I could use the TFW8b 9V DC supplies. That's it for the moment. 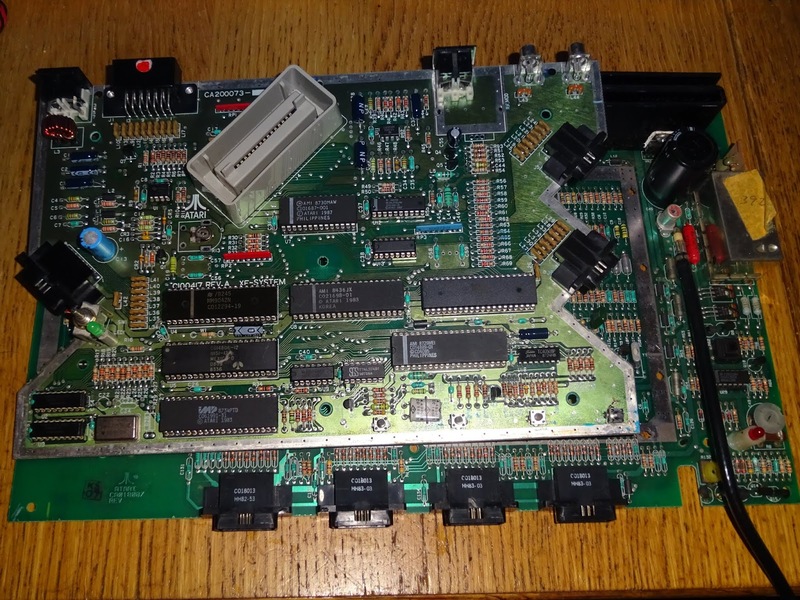 I have more plans for the 5200, I need to either make some new controllers, or make an adapter for an existing controller. 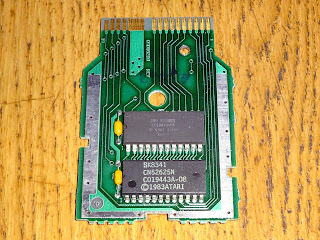 I also want to make a cartridge PCB. 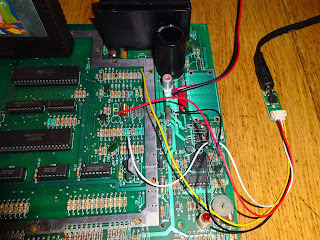 I have been testing with a sort of multi-cart I made by plugging a modified PET ROM/RAM board into the 5200s CPU socket. 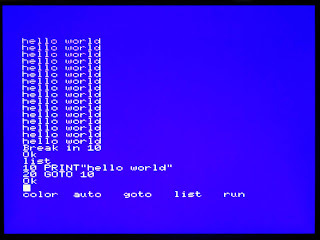 Some titles didn't work. 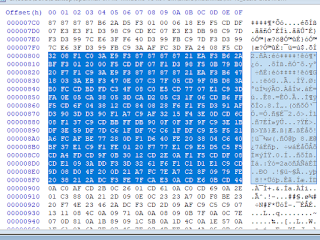 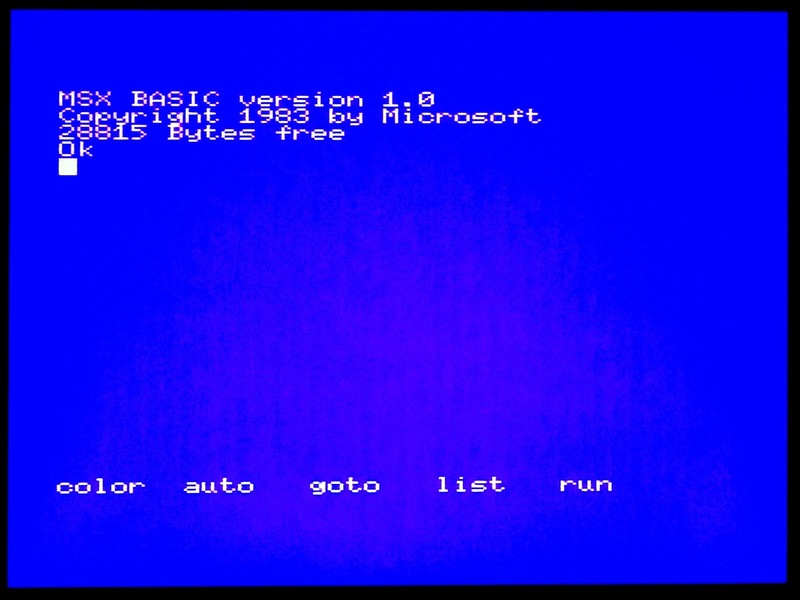 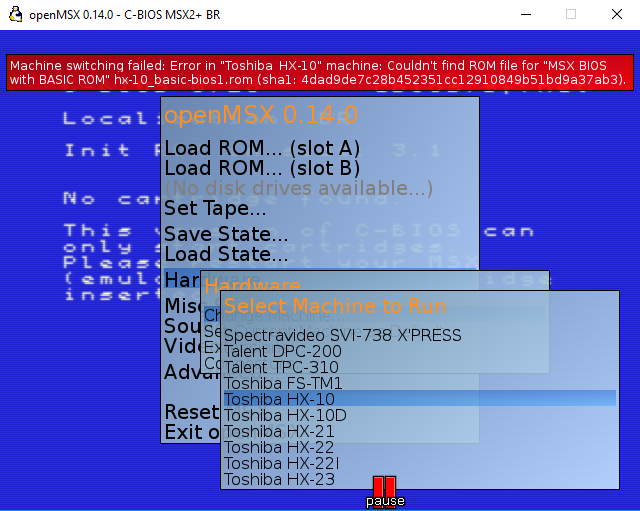 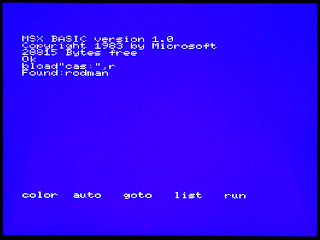 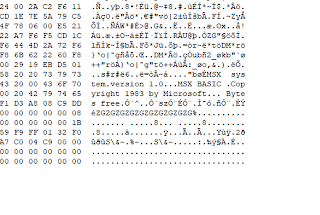 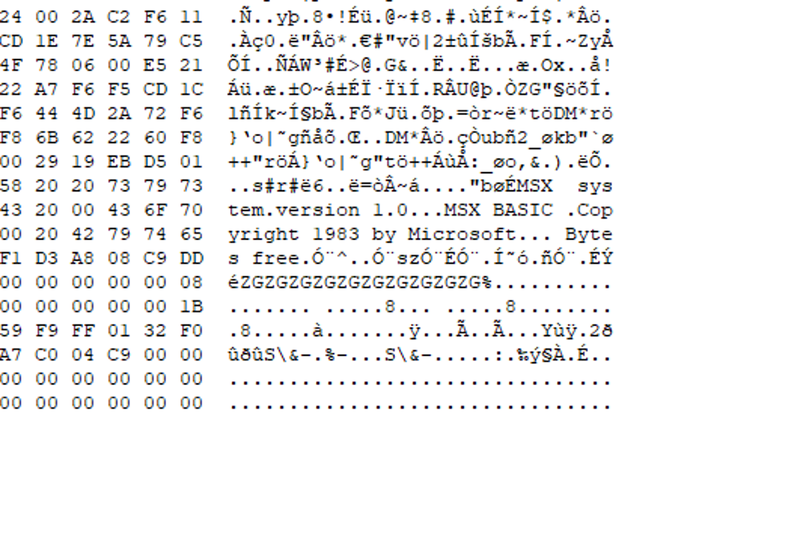 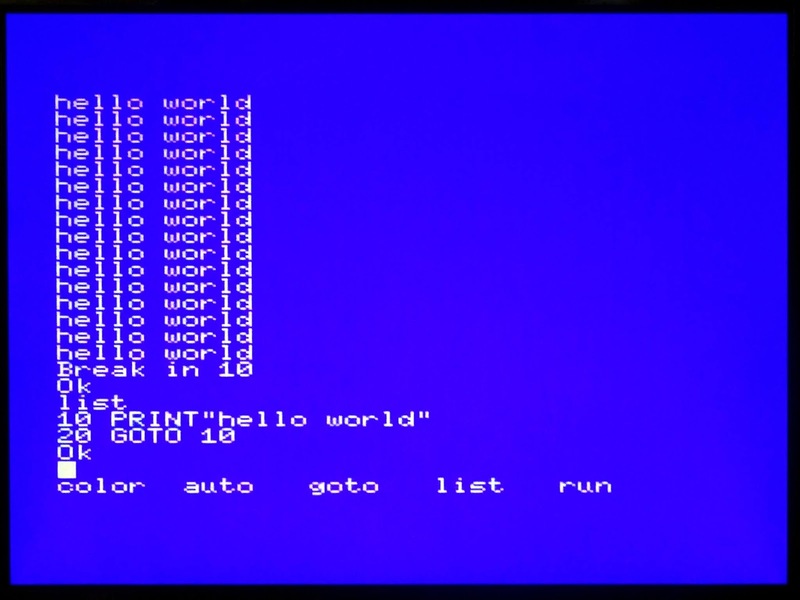 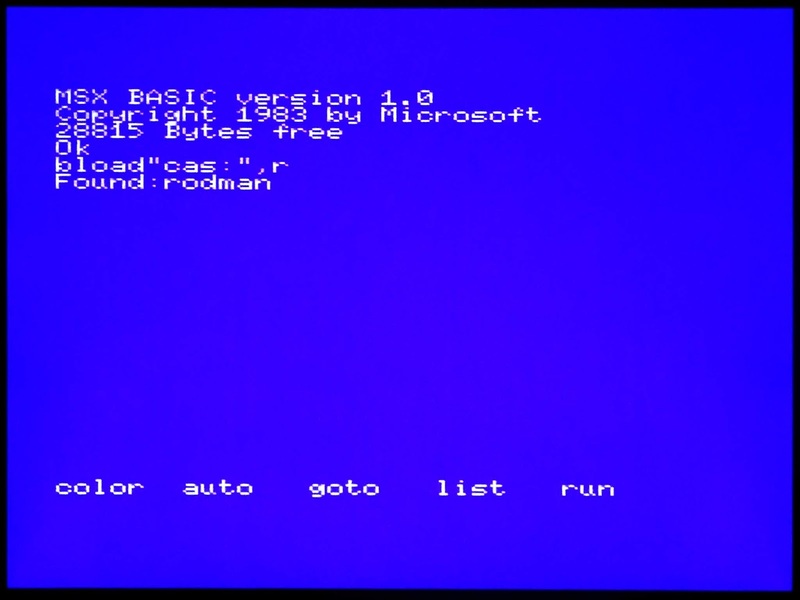 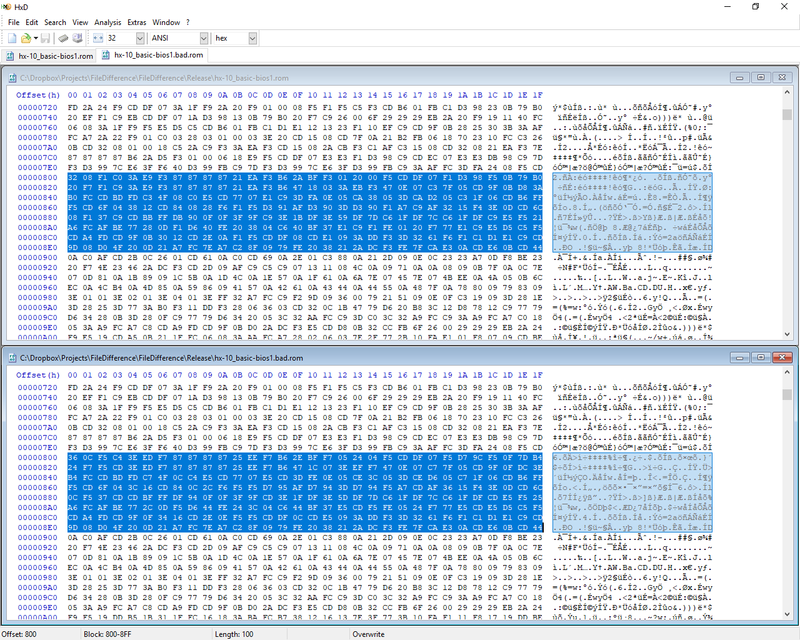 I'm not sure if there is a problem with the 5200, or the ROM images. 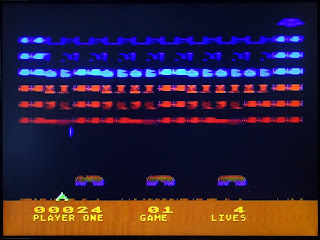 Space invaders played, but the 'invaders' were corrupted. 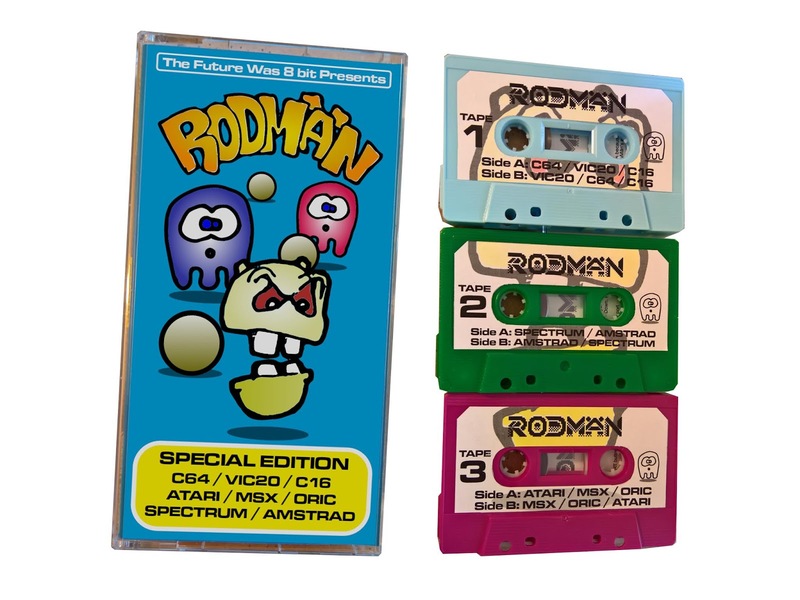 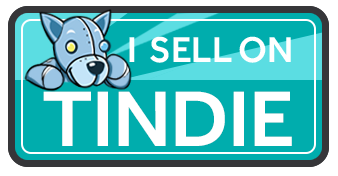 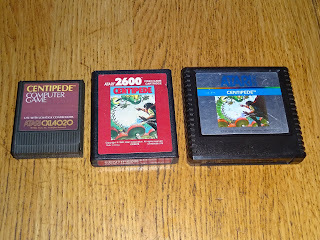 I've ordered some more real cartridges to check. 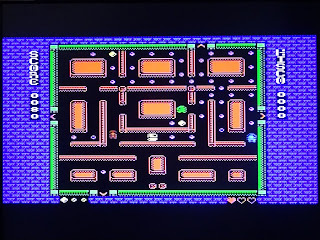 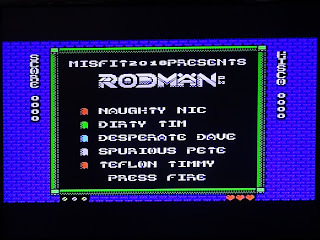 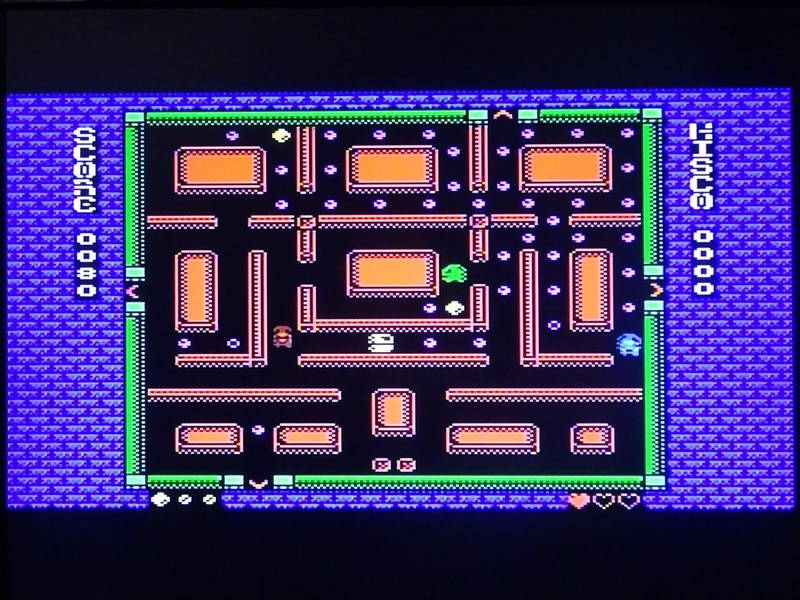 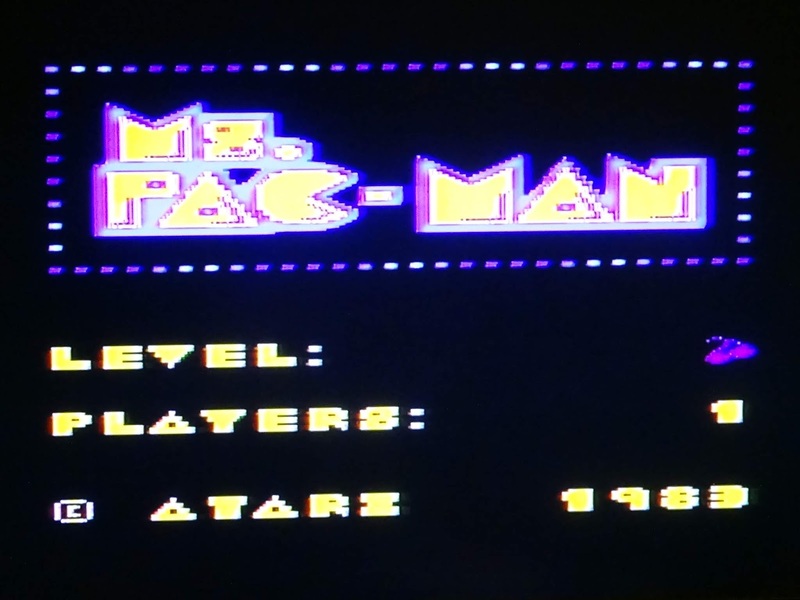 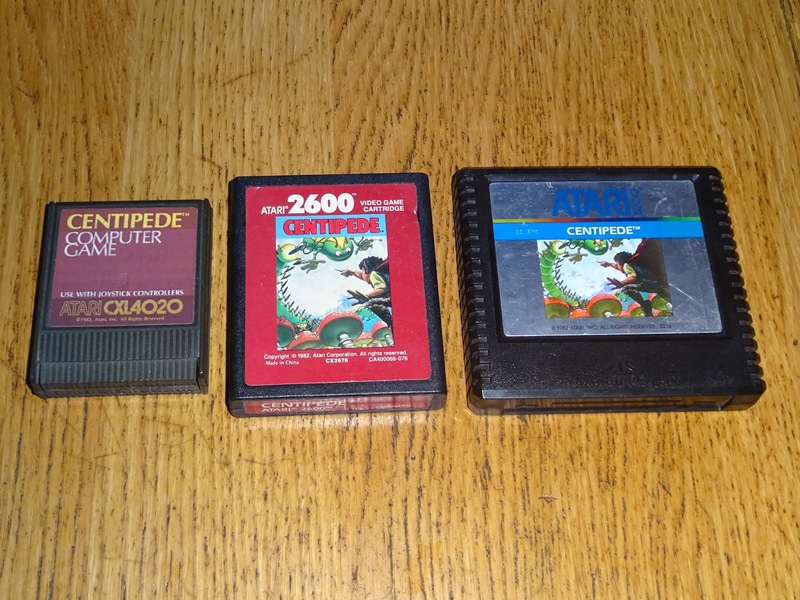 This has allowed me to try out a few more games to test the controllers, and a few more titles you might not expect to find on an Atari 5200, such as Mario Brothers.